I remember when it was a big deal to get business cards. You would marvel over the stack of 500 cards, even bought one of those holders that sat on the edge of your desk. I would look at my cards from time to time, straighten out the pile if it was a little crooked, then sit back and say “I’m worth it for these cards”. You then let those cards collect dust. In time, I learned how important it is to pass on those business cards. I seemed to collect them from others like a kid collects baseball cards. I would go to an event, collect cards, put a rubber band around them and throw into a shoe box in the closet for when I need it. So I realized that my card is not going to become valuable if I hoard them all. I went to the box of cards and found that little piece of vinyl – the little pocket you get with the box of 500. I stuffed about 50 cards in there and whenever I met someone, I instantly gave them my piece of value. I didn’t know what they would do with them. Some probably discarded them. I knew the ones who kept them because they would end up calling me. Then again, some probably put a rubber band around them and place in a shoebox in the closet. Throughout time, we tried to replace the business card. PDA’s would have applications that we could fill out forms. iPhones have the “Bump” app, or even some just take a photo of your card and it’s in the phone. In 2009, I remember the business card tried to get smaller. However, those half-sized cards felt more like a chinese fortune. I ended up tossing those cards because they didn’t fit in the deck I built and didn’t have my fortune on them (…in bed…). These excuses always felt like someone was hiding something. Kinda like if you run into someone in the Goodwill and they feel embarrassed you caught them there. Bring 500 Business cards with you, expect to leave with none. I got some backlash with that statement. People would say they wouldn’t want to get “jabbed” with business cards. I pictured a room full of pirates jabbing their swords and daggers as you moved across the room. ARRR…. Another said they would rather get 10 good contacts than pass out 500 cards. While that is well and good, I have been told one thing in business. One thing that always rings true, no matter what you do. Example: In advertising, send out 10,000 flyers. From those 10,000 flyers, 1,000 will reply. From the 1,000 replies, 100 will become first time customers. Finally, out of those 100 customers, 1 or 2 will become great returning customers. So 100:1 means that every 100 people you meet and pitch your ideas to, one will become interested in what you do. One will become a customer. I am not sure how this person is going to play the odds where she will meet 10 “good” people. I find that all people are good, but then – through time – things change and they are not doing social media or social networking anymore (because for some, this is just a job). So back to my idea, which I’ll expand on: Bring 500; expect to leave with 500 other cards. Why do I say “Bring 500 cards” and not 1,000 or more? Well, there is a point where us people who have to travel to the show have to limit what’s in the bags. 500 is a good number. It’s really a fraction of how many people are actually at the show. If I run out of cards, I could just send the template over to FedEx and have another 500 printed up. OK. It won’t give that much value. But if we end up doing business, then handing out 500 – to get you – is well worth it. You are there to connect. 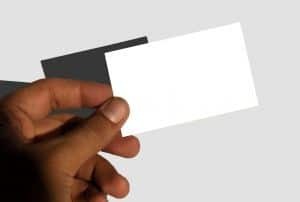 While we have Twitter and Facebook to help connect, sometimes the good ole fashioned business card can prevail over it all. Mostly because you can give it right then and there. I create video. When I get done interviewing someone, the first thing I get asked is “Where can I go to see it”. I could sit there and say to go up on Geekazine.com but 5 minutes later, their mind is on something else. Next thing you know – the video goes up, but they don’t know where to see it. I don’t pass less than 100 cards in an event. Ever. Therefore, when I am at a social event like BlogWorld, I expect to hand out at least 250 cards and get about the same amount back. In the end, I should get at least 2 good contacts out of it. I don’t feel like a swash-buckler. I don’t feel like I am invading people’s spaces. I am just doing what I was taught to do so many years ago. I buy business cards to give them out. I get business cards to make connections. I make connections to be more successful. A lot better than having them sit on the desk, don’t you think? Jeffrey Powers is a Blogger and Video Podcaster for Geekazine.com and the Tech Podcast Network. You can find Jeffrey on Twitter @Geekazine.